Look what I scored curbside this spring for my shed. During spring cleanup in our town, I found a couple windows for my porch. The windows are in great condition and a wonderful addition to my shed for FREE! My neighbor offered me an old door that was heading to the curb. Score! The door is perfect but needed a little help. I used a striping agent to strip off a few layers of chipping paint. I plan on painting and distressing the door to match the windows and then add strips to the window to match the door. So much to do! 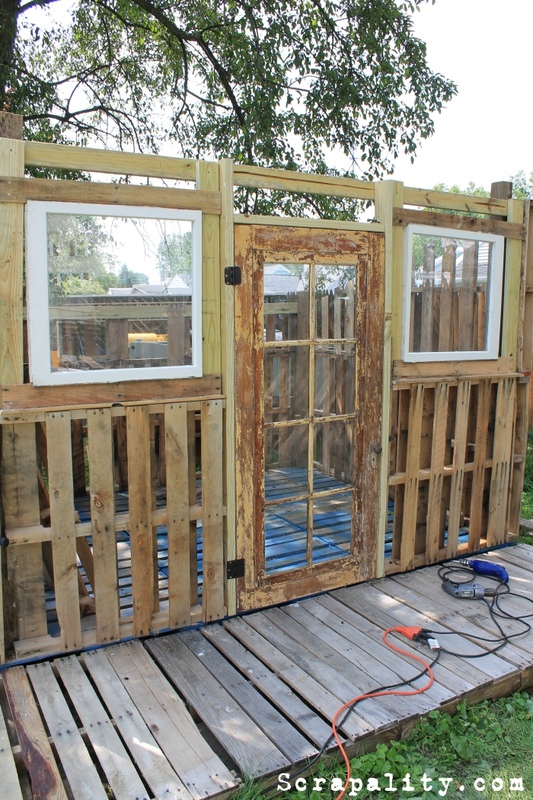 We used 2×4’s to frame in the door and the windows. The 2×4’s for the roof and the framing, so far, are the only wood purchases. The 4×4’s were from a project from our previous home that were disassembled and shipped to our new home. More to come… Finish framing and the outside walls. This may be the best thing on the internet. Thank you for sharing. I’m a keen collected of other’s unwanted bits and bobs! And have made many a thing out of old pallets etc. I’m about to build my own shed so, Please put me on your mailing list.